More in this Section... Basic Pet Bird Care Zoonotic Diseases in Backyard Poultry Signs of Illness When Should I Take My Bird to a Veterinarian? 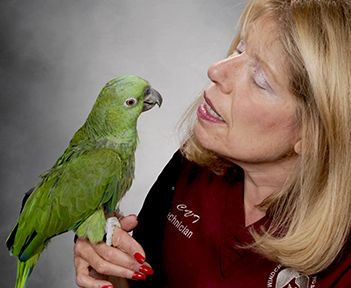 The most valuable step for a new bird owner is to locate an experienced avian veterinarian, preferably one who is a member of the Association of Avian Veterinarians (AAV). Check with local bird clubs, your closest veterinary school, or with local veterinarians or visit AAV.org to obtain recommendations. The AAV recommends a veterinary examination of any newly purchased bird within three days after purchase. If disease is present, the likelihood of an accurate diagnosis and appropriate treatment is enhanced by early detection. Many serious diseases are not visually evident in birds. Even if the new bird checks out ‘’normal,’’ results of diagnostic tests performed at the initial visit provide valuable reference for subsequent examinations. Much of the time spent during a consultation is spent obtaining valuable background information about your bird and the reason for your visit. Historical information is essential for getting to know your bird and the circumstances surrounding a health problem if your bird is sick or injured. Information is obtained about your bird’s age and gender (if known), and where and when your bird was obtained. Other vital information is collected, such as diet, supplements, caging and environment, previous health problems, and recent exposure to other birds. If your bird is sick or injured, specific questions will be asked about your pet’s condition. It is a good idea to bring any previous medical records, medications, and X-rays if your bird has already been treated by a veterinarian and if you have access to these materials. Your bird will first be observed in its enclosure. Your bird should be alert and fully aware of its surroundings. If your bird is staying fluffed or keeping its eyes closed, this is a warning sign that your bird is probably very sick. Other important clues to serious health problems include difficulty breathing, loss of voice, generalized weakness, and lameness. Most birds will need to be physically restrained for examination, with few exceptions. Although some birds do well during examinations, others can be quite fearful and can pose risk of injury to themselves and others in the room. There are a variety of handling and restraint methods that your avian veterinarian will be familiar with, all of which aim to be least intrusive or fear-evoking and yet effective for what needs to be accomplished. Methods are adjusted to meet the needs of the individual bird and circumstances. Comfort, minimal fear, and no pain are the common goals, as would be for ourselves in our own physician’s office. It is generally not recommended to ask your veterinarian or their staff to step your bird up directly from you, or for you to handle and restrain your own bird during the exam. There are resources available to help you train your bird to be a more willing participant in the veterinary exam and even treatments that may be needed. Your veterinarian can guide you to options, principles and some specific methods that may best apply for you and your bird, should this be appropriate. Your bird will be weighed, usually using a digital gram scale. Your bird will be carefully examined from tip to toe, including evaluation of the eyes, ears, nares, beaks, oral cavity, choana, neck, crop, pectoral muscling, wings, plumage, belly, vent, legs and feet, spine, and preen gland (if present). The heart, lungs, and air sacs are assessed by auscultation with a stethoscope. If a band number or microchip is present, it will be recorded in the medical record. Visual inspection of your bird’s droppings can provide many clues to your bird’s health. Bird droppings consist of three major components – feces (normally green or brown and tubular in shape), urates (creamy white and similar to toothpaste in appearance) and urine (clear and watery). Droppings are assessed for changes in volume, color, and consistency of the feces, urates, and urine, and for evidence of fresh or digested blood or undigested food. Feces can be further evaluated for parasites and other potentially harmful micro-organisms using diagnostics such as wet mount evaluation, flotation, Gram stain, and cytology. Your veterinarian may recommend bloodwork to evaluate the overall health status of your bird. One common blood test is the Complete Blood Count (CBC), which evaluates the quantity and appearance of your bird’s red and white blood cells and thrombocytes (platelets). The CBC is used to detect anemia or evidence of a systemic infection or other inflammatory diseases. Another common blood test is the biochemistry profile (CHEM), which assesses your bird’s organ functions, such as kidney and liver, and other biochemical indicators, such as blood glucose, blood proteins, calcium, and electrolytes. Several screening tests are available for the detection of psittacosis, which used to be called “parrot fever.” This is an important part of the new-bird exam or annual checkup because the causative agent, Chlamydia psittaci, may be transmitted from birds to humans and may also make your bird sick. Many infected birds appear clinically healthy on visual inspection or on physical examination (see AAV brochure, “Avian Chlamydiosis and Psittacosis”). Most parrot species are monomorophic, meaning that the males and females look alike to us on visual inspection. For these species, gender can be determined with a simple blood test sent to a laboratory. Your veterinarian may recommend a culture of the choana (throat), cloaca (vent), crop (esophagus), or other sampling sites to determine abnormal growth of bacteria or yeast. At the same time, antibiotic sensitivity tests may be used to determine an appropriate antibiotic if the bacterial growth requires therapy. There are several viral diseases of clinical significance to birds. Birds can be screened for these diseases when appropriate after discussion with your veterinarian. Your veterinarian may recommend routine screening in certain instances, or if your bird has clinical or diagnostic findings consistent with a certain viral disease. Common viral tests include serology (antibody testing), and Polymerase Chain Reaction (PCR), which looks for minute amounts of viral DNA in the sample. If your bird is sick or injured, there is a good chance your veterinarian will recommend survey X-rays to evaluate areas of concern such as the internal organs and skeletal structures. Many veterinarians advise sedation for X-rays. While there is always some inherent risk for sedation and anesthesia in birds, the benefits of sedation include reduced stress, reduced risk of injury, and ideal patient positioning. Vaccination is available against certain viral diseases, such as avian polyomavirus. Avian polyomavirus is a serious viral disease of birds, particularly of juvenile birds. Speak with your veterinarian about the vaccines they recommend for your pet bird. Isolation and quarantine of a new bird, even those that are believed to be “healthy,” is the first and most important thing an owner can do. In order to protect other birds on the premises, it is advised that all newly acquired birds be maintained separately for a period of at least six weeks following purchase. Many airborne viruses may be spread from room to room by central air conditioning or heating systems, so an off-premises location is preferred. Pet owners are accustomed to taking the family dog or cat to the veterinarian for an annual checkup. It is even more important for a pet bird to have regular examinations because symptoms of disease in birds tend to be much more subtle. Because birds hide symptoms of disease, signs of the beginning stages of disease often go unnoticed. Annual checkups are advised for early identification and management of potential disorders. New information about birds is continually being discovered. Consulting with your veterinarian will keep you up-to-date on recent advances. Ask your AAV veterinarian for the latest information brochures and news releases from the AAV. Follow AAV on Facebook (www.facebook.com/aavonline) for great tips and the latest news for pet bird owners. You can also find us on Twitter (@aavonline) and YouTube! Our website, www.aav.org, offers a Find-a-Vet tool to help pet bird owners locate avian veterinarians around the world. We also offer a variety of resources such as basic bird care instructions and more. Visit the website today! AAV offers bird clubs a monthly news bulletin for use in their newsletters. Clubs may contact the Publications Office (pubs@aav.org) for information. When Should I Take My Bird to a Vet?